I went to Stob Coire nan Lochain with Edinburgh University fresher Alex McMillan on Saturday to try and get some late season wintering in. I intended to make the second ascent of a recent Simon Yearsley/Malcolm Bass route "Twisted" (VII,7) but unfortunately this didnt look "in". I had lots of back up options but all of these were steep and had been stripped of snow in the lower parts. I walked in quite quickly so I had a look through the guide and decided to try and find some new ground. I settled for a line between Twisting Gully and Forked Gully Right Hand. We started at the foot of the buttress at the lowest rocks. 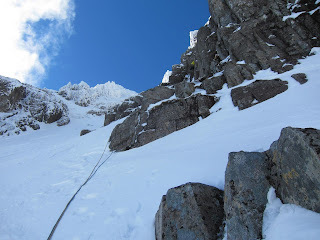 I made my way up snow slopes to a short corner, climbed the corner then followed the snow again until I found a belay underneath a steep, turfy groove line. I had hoped to climb this but it was dripping with water and didn't have as much snow on it as I had thought. I decided to keep on climbing up the snow slope until I found a suitable place to breach the steep wall. I found another narrower groove line about 10m above the belay and attempted to climb this. I climbed a few meters up on thin hooks but decided it wasn't really going to go as I couldn't find any gear and it looked like it was going to get harder higher up, so I down climbed. 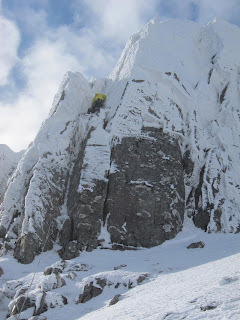 Just to the left of the groove was an icy ramp which I climbed instead. Above this was another, slightly steeper, icy groove which led quite nicely to a belay on some broken blocks. The final pitch was the reason why I had chosen this line. 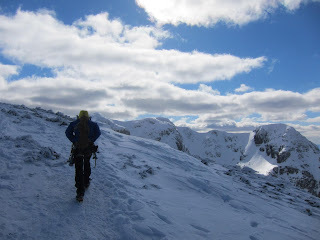 I could see some very white looking rocks from the coire floor which didn't seem to have any routes up them. I took the left hand groove on this. The groove started off nicely with some good ice in the back but got increasingly steeper with less foot placements until a steep pull over a bulge brought me onto an icy ramp. 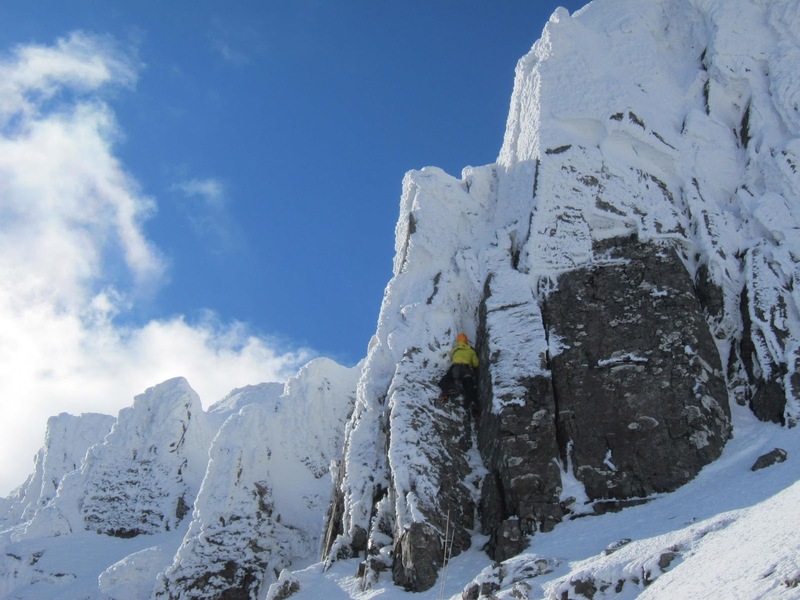 I climbed this to its top and made my way carefully through the final couple of meters to a small cornice. I broke my way through that and topped out into amazing sunshine. I have emailed Andy Nisbet to ask whether its new, and he seems to think so. I have decided to call it Seattle Grooves. I have named it this as I only found out that Alex is from Seattle on the drive over. I have graded it IV 5, but im not too sure really as some of the moves could be tech 6. We finished this quite early so climbed Spectre (V,6) to finish off the day. I managed to climb it in 2 pitches, although I got to the final belay on rope stretch. I have just been reading through your climbing blog and am wondering whether you’d be interested in receiving some free-of-charge items from time to time to review on your blog? We are an independent retailer of outdoor clothing & equipment, and are looking to generate a small network of quality bloggers to occasionally review products and include links from their blog to our website. The benefit to us is an increased Google presence generated from the links, as well as the potential to develop a working relationship with people such as yourself. The benefit it to you is… well, free stuff! The content of your blog seems to suit our customer-base and we are currently trying to grow our presence in the climbing world. Let me know if this is something that would be of interest and I look forward to your response. Yes I would be interested. Email me on h.holmes-2@sms.ed.ac.uk to discuss it further.